We are offering U Bolt Rod Clamp to our client. Size: 19mm, 25mm, 32mm, 38mm, and 50mm. Packing Size: 19mm, 25mm, 32mm, 38mm, and 50mm. We are engaged in manufacturing, exporting and supplying excellent quality Forging Wheel Bolt Clamps to our valuable clients. 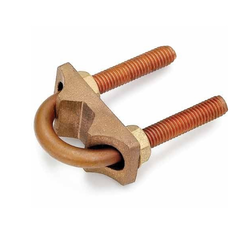 U Bolt are Manufactured from Gun -Metal and Copper Alloys. Owing to our enriched industrial experience, we are deeply engrossed in offering U Bolt Clamp widely used for numerous industrial applications. 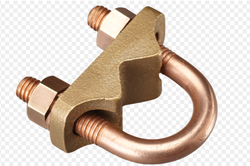 These clamps are used to connect tape to the earth rod. Available in single plate and double plate, application being the same but suitable for fixing different angles. Made of strong copper alloy / Gunmetal. - Size: 5/8", 3/4", 1", 3/2", 2"